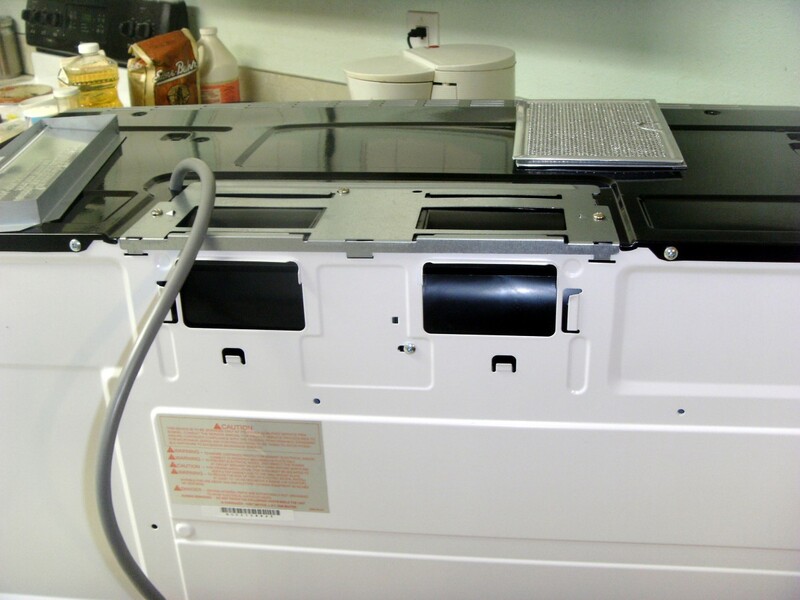 Most of the time, installing an over the range microwave oven is not difficult, but each house is different, and problems can be encountered. 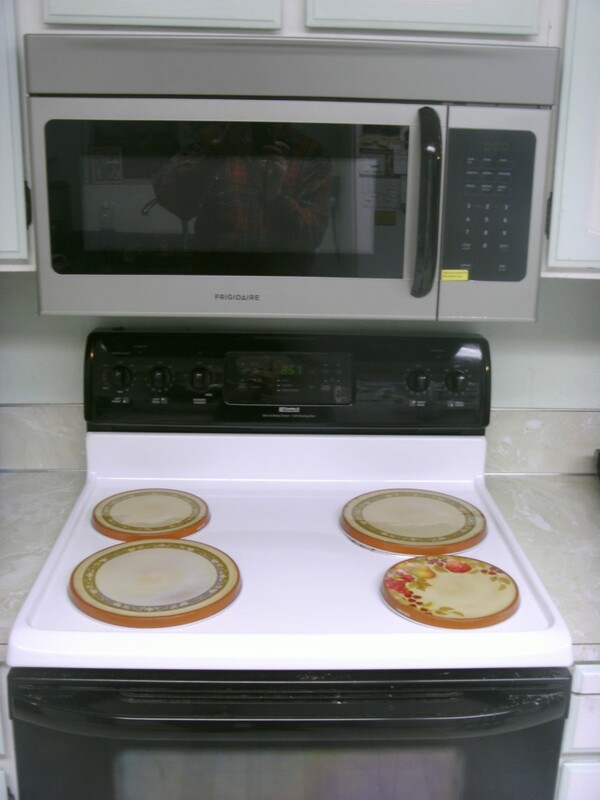 This article is designed to cover some of the potential problems that may be found as well as give basic instructions on how to install an over the range microwave oven. The descriptions and photos are from the third over-the-range microwave oven I've installed in recent months, with the work being done this time in an older home. Older homes often present the most problems, from electrical to cabinetry, and some of those problems and the solutions to them are presented here. 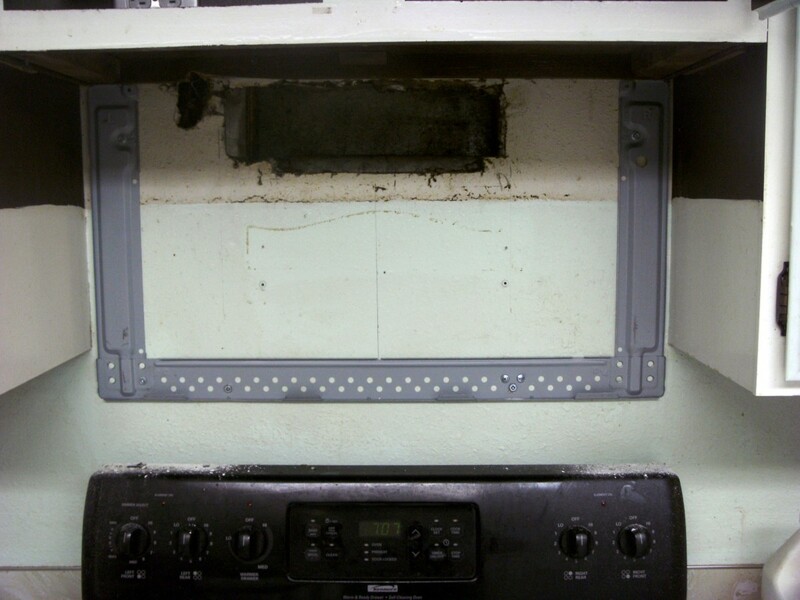 Even with the problems encountered, the task of installing the over the range microwave was not difficult and took about two hours to accomplish. All three of the units I've installed came with good descriptive instructions, and all three were very similar in installation procedures. 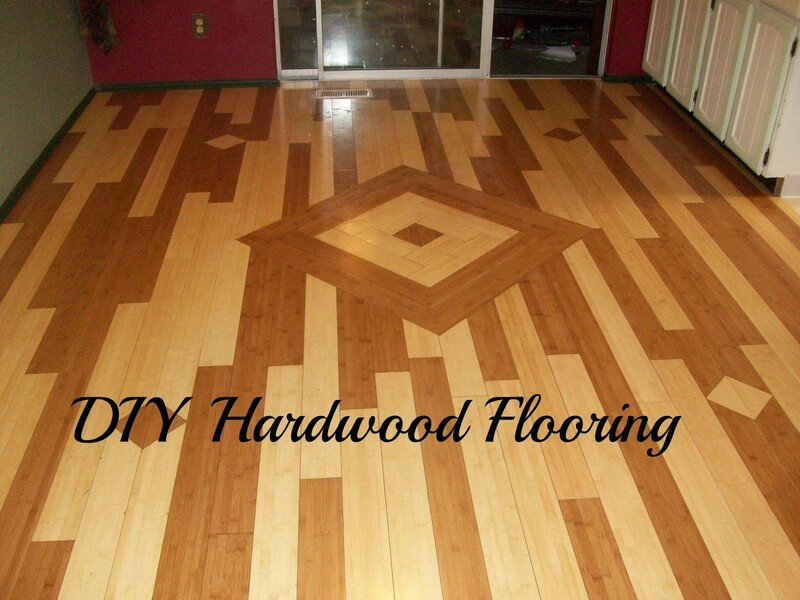 The work is well within the capabilities of most homeowners. The task began with the removal of the old range fan unit, mounted in the place the over the range microwave oven was to occupy. The home I worked in is about 40 years old, and construction methods were somewhat different then. Although the normal 30" wide microwave fit easily into the space provided by the range and cabinetry and the necessary 30" clearance from the bottom of the microwave to the range was more than adequate it didn't take long to find that there was no reasonable power source for installing the new microwave oven. The old house had the range fan hardwired, without a plug in for the microwave, and while it is possible to wire the new microwave during the installation process it is not the optimal solution. In such cases the power for the range fan simply pokes through the wall behind the fan, is run into the fan and hooked up. A new receptacle is needed in the cabinet above. Turn the power off before continuing any further! The best method to make sure the power is off is to use a non-contact voltage detector, but the fan light could be turned on and the breakers turned off until the light goes off. What ever method is used, make sure the power is off before disconnecting the fan. The area where the power cable comes through the wall will be hidden by the microwave, so even fairly large holes in the wall won't be of any particular concern. 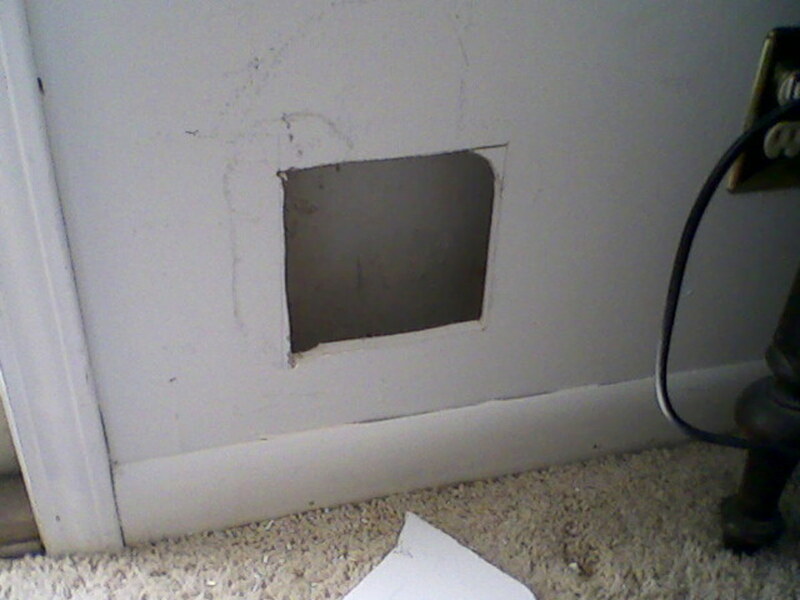 I found that the hole where the wire came through wall was quite large, perhaps 2" X 4" - plenty large enough to work through, and the wire was easily long enough to run higher, inside the wall, and exit through the back of the cabinet just above. It only needed to go up a few inches, and there was plenty of wire to do that. A new hole was cut through the back of the cabinet just large enough for a "old work" electrical box, and the wire easily fished into that hole. Before cutting the hole, the general area where the plug was to go was investigated from the original hole below, and I found that there were two other wires in the area. 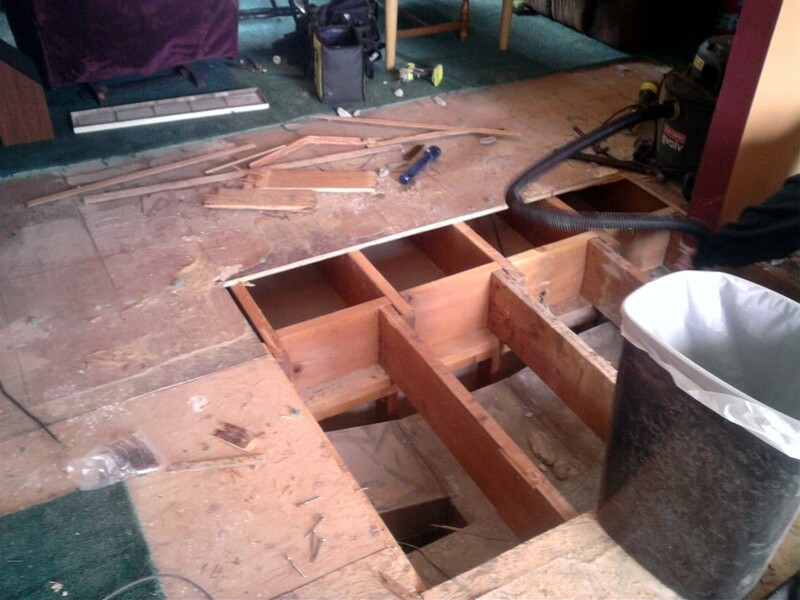 The plan had been to cut the hole through the cabinet and sheetrock wall behind it with a sabre saw, but that would probably cut the wires buried in the wall, so a sheetrock saw was very carefully used to cut the hole. A little more work, but it prevented damaging the wires behind the wall. If you are not familiar with the installation or wiring of outlets, instructions are available in the link here; be sure to read and understand them. 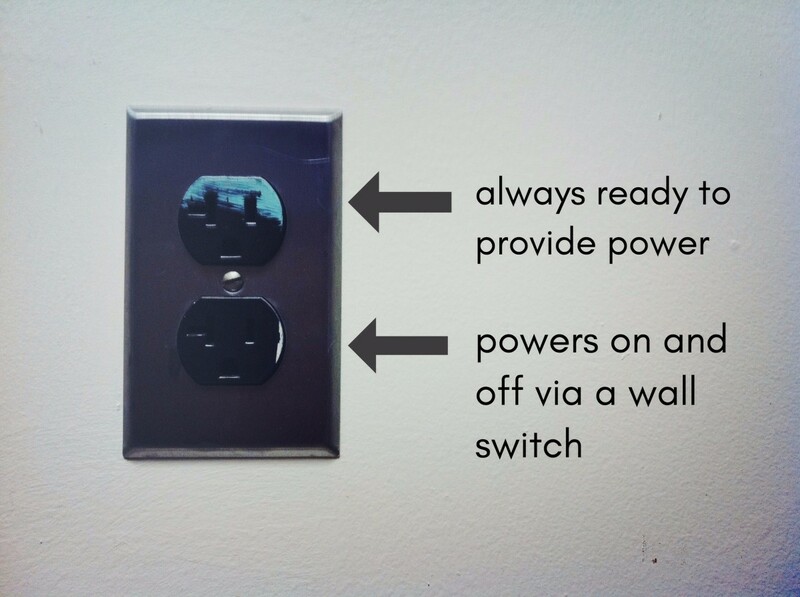 In particular, make sure the power is turned off before any work is done. With the new plug in installed and the fan removed, the work of actually installing the over the range microwave was ready to proceed. The first step in installing the new microwave is to attach the mounting bracket to the wall. The exact center of the area is measured (in my case 15 1/16" from each side) and a line drawn down the wall. The bracket is centered on the line and attached to the wall. 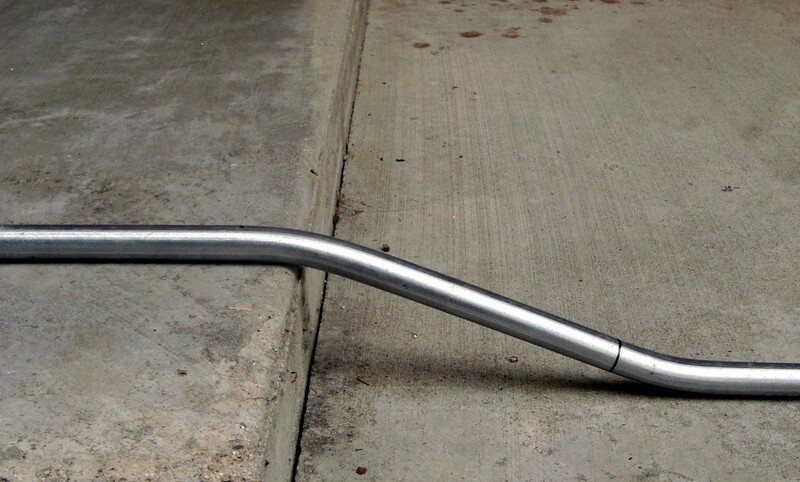 Attachment is accomplished by either using toggle bolts or wood screws. The instructions indicated that at least one wood screw is to be used, so the studs must be located for that screw, as well as any others that might be used. 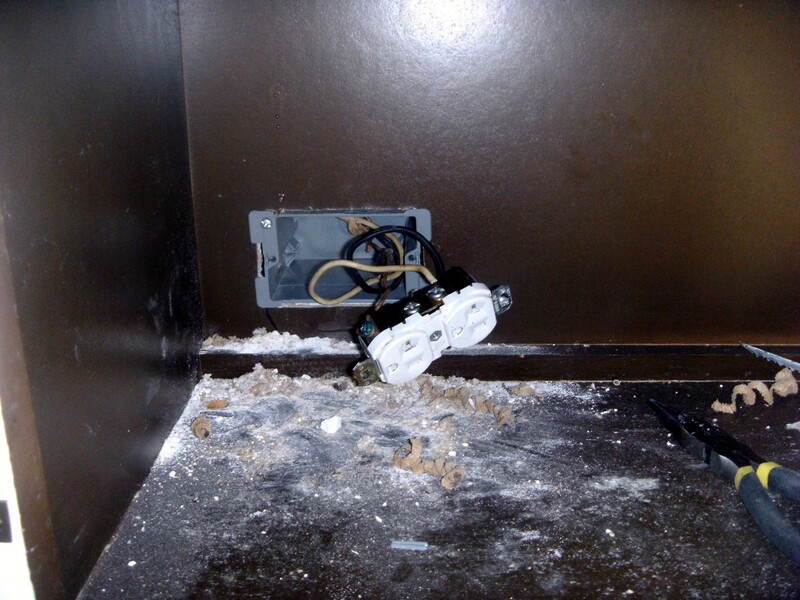 In the case here, the studs were visible through either the exhaust vent hole or the smaller hole where the wire originally came through the wall, but in most cases a stud finder from your homeowners tool set is very useful. In my case there were wooden blocks installed on the underside of the cabinet to support the fan, and these blocks extended from the front to the back under the cabinet. The blocks resulted in the bracket being installed just barely too high and it had to shifted just slightly down by loosening the screws and pushing down. The instructions indicate that the bracket should touch the bottom of the cabinet; I suggest that it be installed perhaps 1/16" or 1/32" lower down. It will make installation of the microwave easier if this bracket is just below the cabinet instead of touching it. Holes need to be drilled through the wall for the toggle bolts; 5/8" is the perfect size for most toggle bolts, and a spade bit makes quick work of the sheetrock. The stud(s) to receive wood screws should also be predrilled as the large screws may split the wood and are difficult to drive without predrilling the 1/16" hole recommended. In my case, I found an additional stud that could be used and so used 3 toggle bolts and 2 wood screws instead of the 3 toggle bolts and 1 wood screw. It doesn't affect the installation of the oven and provides a more secure support. The cabinet bottom needs preparing as well; holes must be drilled in exact locations for screws to pass through and screw into the microwave. 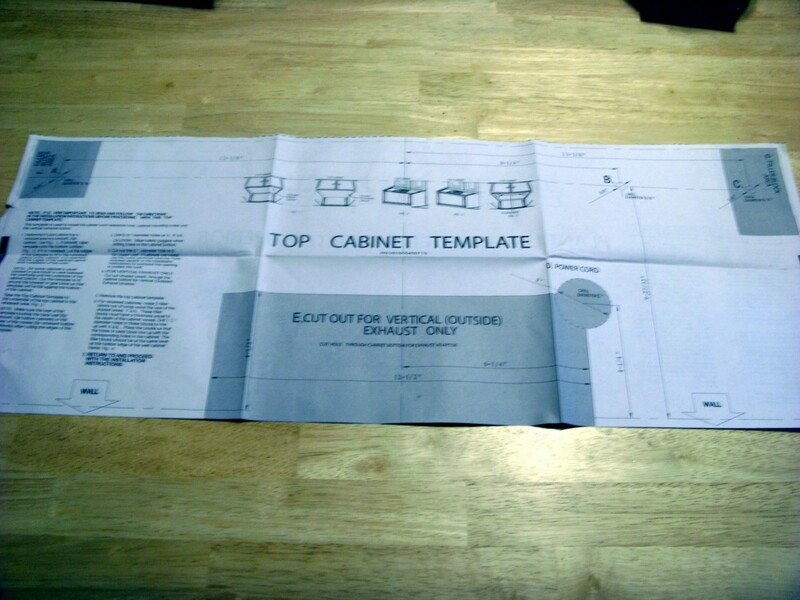 A paper template is provided to locate these holes; tape it to the bottom of the cabinet and drill where indicated. Holes that are 3/8" in diameter are the preferred size for the screws, while a 1 3/8" spade bit provided the hole necessary for the electrical cord to pass through that was just right for that cord end. The instructions indicated a 2" hole for the cord, but that is overly large; the smaller 1 3/8" hole was perfect. The sides of the cabinet generally project down past the bottom of the cabinet, and in this case a wooden block needs to be made so that when it is placed under the cabinet it is the same height as the sides are. The installed microwave will touch the bottom at the lowest point (i.e. 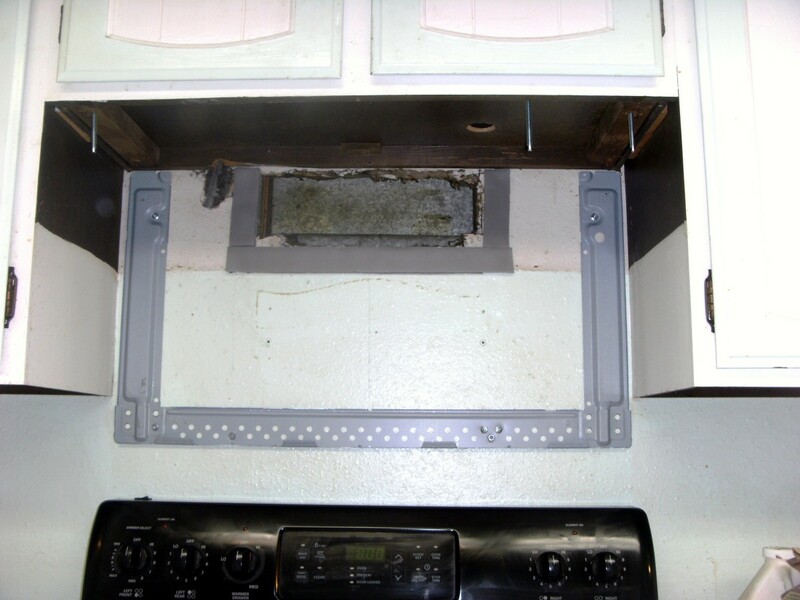 the protruding cabinet sides) and the screws will deform the top of the microwave as they are tightened if there is no surface to stop the sheet metal of the microwave from being drawn up. Drill the same 3/8" hole in the blocks so the screw will pass through the bottom of the cabinet and the block into the microwave. In my own case the block needed to be 1 1/4" thick; a typical ¾" pieced of wood coupled with a piece of ½" plywood would have been perfect, but blocks were already in place to support the now removed fan. Unfortunately the holes in the bottom of the cabinet and the blocks were almost, but not quite, in the correct spot. And additional 1/2 hole needed to be drilled; this was done by working the drill bit up and down with side pressure applied until the holes were in the correct place, but elongated. The screw head nearly fell through the elongated hole, which is of course unacceptable. I chose to use some large "fender" washers on top to cover the hole; these washers are over an inch across with only a 1/4" hole for the screw to go through and thus covered the overly large hole in the cabinet bottom and spread the weight out. Alternatively, a new false bottom could be placed in the cabinet, made from hardboard. As it came from the factory, the exhaust blower in the microwave was installed to recirculate air back into the room. The duct work to exhaust it outside was already in the wall, so it only made sense to use that duct, which the microwave is designed to do with a little modification. 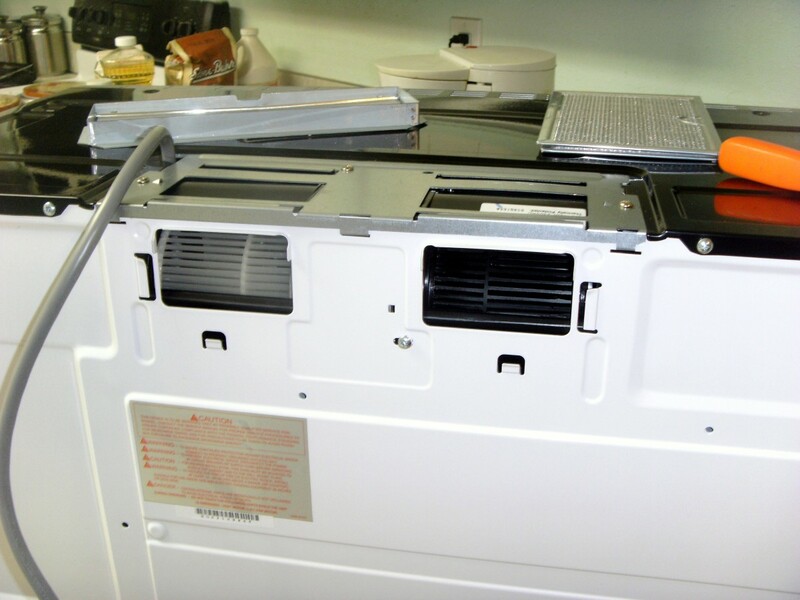 The photo shows how the exhaust area in the microwave is closed off from the factory; the blower assembly is removed from the microwave, turned to the orientation shown in the second photo and reinstalled. It sounds much more complicated than it is; the entire procedure took less than five minutes and was very easy. The duct in the old house was not in real good condition and was considerably larger than the exhaust from the microwave so foam insulation of the type used around doors or windows with a sticky side was used on the wall to seal the area. 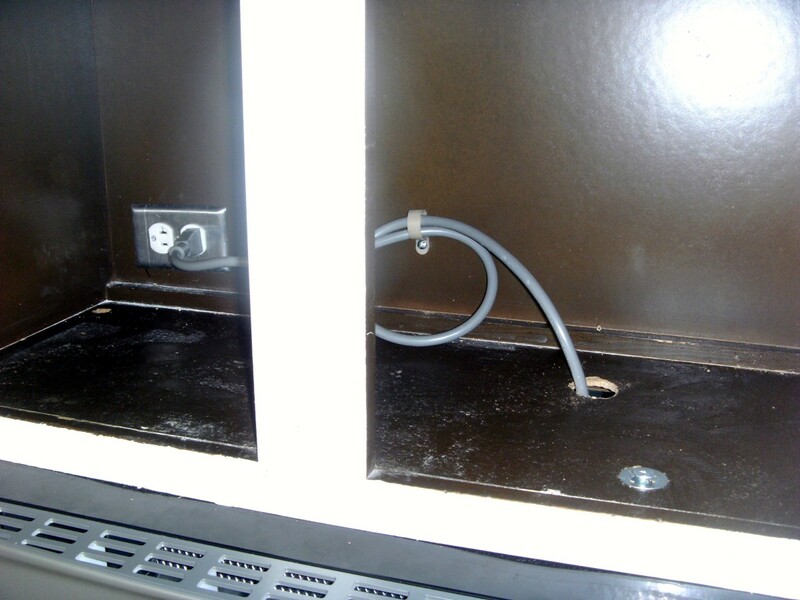 In this manner the back of the microwave is sealed against the wall except for the ducting, and air must go up the duct instead of around small cracks behind the installed microwave and back into the room. This can be seen in the photo above that also shows the bolts passing through the cabinet bottom. It is the gray area around the duct. The insulation on hand was wide, but quite thin at about ¼" thick, so two layers were used. 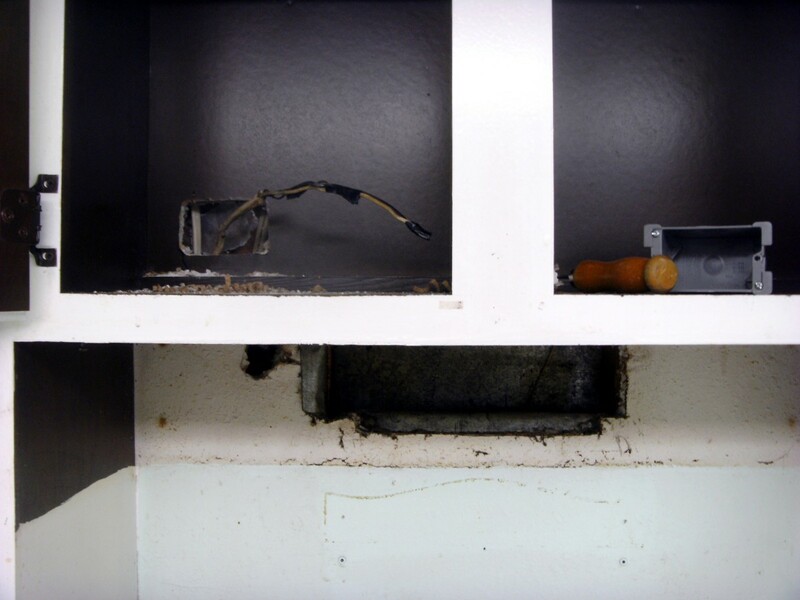 The actual installation of the microwave is quite simple: the bottom rear of the microwave is set onto the small hooks on the rear bracket screwed to the wall, the plug and cord fed up inside the cabinet, and the unit tipped up into place. The long screws need to be placed through the holes in the bottom of the cabinet and screwed into the microwave and the cord plugged in. My unit had three screws into the top of the microwave, with a notation that the center one is not to be tightened too much. In my case the grease screens needed to be installed into the bottom of the microwave and the glass turntable set into place. The clear plastic film over the keypad needed to be removed, and voila! the unit is ready for supper. Most of the tools I used are common around the house, although I did use an impact driver for driving the wood screws. A cordless drill will work nearly as well, and even a screwdriver would do the job with a good deal of effort (the screws provided are quite large). Is It Easy to Install a Microwave Over a Range? How Hard Is It? Probably the biggest obstacle for most homeowners will be a lack of confidence, but you can learn to do most home repairs yourself. All it takes is a little time and a few of the right tools. My own experience in installing this particular over the range microwave would tend to indicate that they can be installed in virtually any home. At absolutele worst I would expect a new power line to have to be pulled from the circuit panel or nearby plug, and new ducting installed if there is none and the owner insists on an outside duct. On a scale of 1 - 10, this task rates about a 3. My total time, including mounting the new plug, cleaning up afterward and taking photos was about 2 hours. 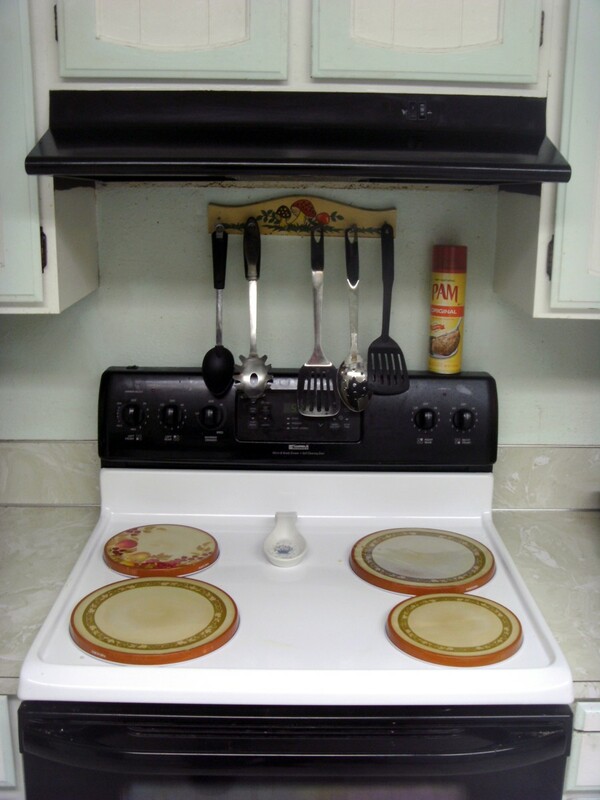 If there is no wall behind the stove, are there brackets to attach to the cabinets to install an over-the-range microwave? None that I have seen. Nor is the microwave capable of being hung there - it is designed for most of the weight to be on the wall. Most cabinets would not hold it anyway. What if the existing vent to the outside and the new microwaves vent do not match up? There is an inch between the top of the microwave and the bottom of the cupboard. Most microwaves must be bolted to that upper cabinet, which means you will have to put in a small spacer between the cabinet and the microwave. The vent must then be extended down to the microwave with some sheet metal; with only an inch or so to go, I would suggest purchasing some roof flashing and cutting and bending it to fit. Our existing hood fan does not vent to the outside. 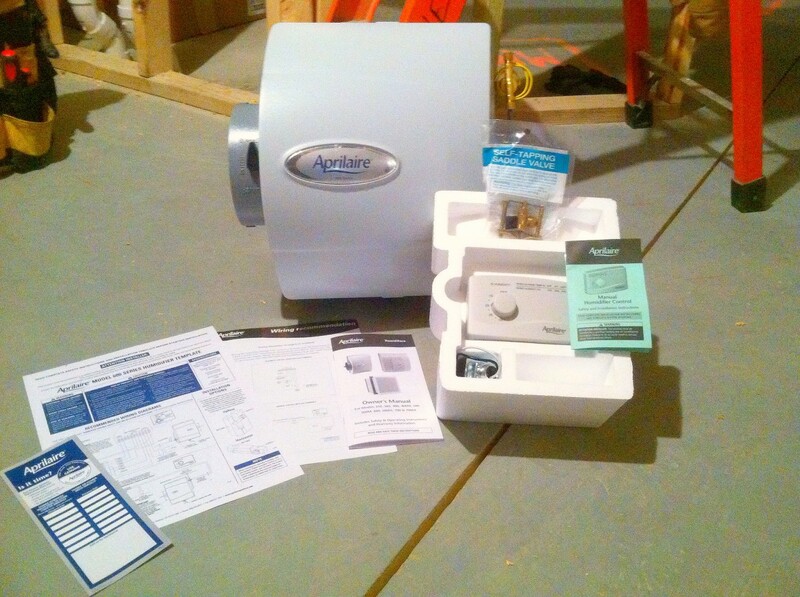 So I need ductwork to the outside for a proper install? Only if you want to vent the range fumes and steam outside. Most if not all microwaves come with the ability to either vent outside through a duct or to filter it and blow back inside. Does the microwave need its own circuit? A microwave should, ideally, have it's own circuit. It is not absolutely necessary, but you should be prepared to watch and not overload the circuit. A microwave, an electric skillet and a coffeepot, for instance, will likely pop the breaker. Are most cabinets sturdy enough for a Hood microwave? Yes. Considering how much can be put in a cabinet, and how much is typically put into cabinets high over a range, there should never be a problem. Plus, of course, the wall is carrying a good deal of the weight. Tipping one into place and screwing it to the cabinet takes some effort, but a lot of the reason is bulkiness and awkwardness. The actual weight of the cabinet is not great. Are there microwaves that install on the wall only? As far as I know, no. While it would be possible to design such a system it would certainly require additional wall strength; sheetrock alone would never hold a microwave oven and it's contents. Is the existing electrical the correct voltage for the microwave? Are typical exhaust fans less? 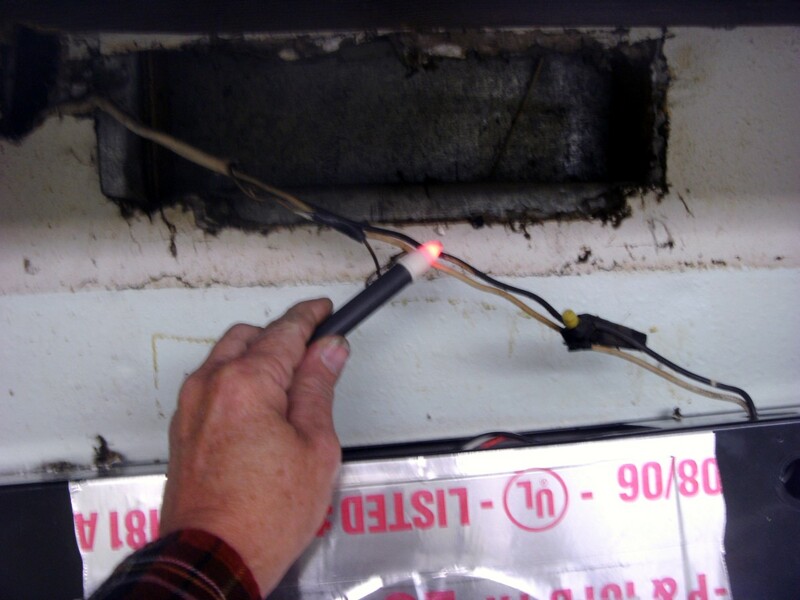 The typical voltage for both is the 110 Volts found throughout the house. We are installing the same make of over-the-range microwave. However, we can’t get it level front to back. Why? I would suspect that the manufacturer changed the specs slightly on the exact placement of the supports on the microwave. Or that some spacers under the cabinet have fallen off unnoticed. Either way, the likely solution is to add a small spacer under the cabinet if the microwave is tipped up in the front. If it is already too high the bracket on the wall will have to be moved. Could you explain how these instructions for installing and over-the-range microwave work? I'm certain that the circuit amperage used for the vent hood you replaced can't power the microwave. The microwave needs to be on 20amp circuit. Most hoods were on less and tied into other kitchen circuits, like ceiling lights. Do your breakers pop? You are correct in that a microwave needs a large circuit, such as the 20 amp circuits that the electrical code requires for kitchen outlets. And you are also correct that mine was tied into just such an outlet. Most range fans will be wired that way; the only other options are to tie it into some other circuit or run a dedicated circuit just for the fan. In my case, the microwave, toaster, coffee pot and electric griddle all ended up on the same circuit - mine is an older home without a lot of circuits. Running three of those at the same time does pop the breaker, but any two, including the microwave, is fine, and that would be pretty typical. What is the required height from stovetop to bottom of the microwave? The microwave should be no less than 13" above the range. In addition, it should be no more than 54" above the floor - any less and it can be difficult for shorter people to use. Connie: You have two problems here. You are wanting to move the microwave only 1/4", to a 3" gap on both sides. It may be possible to slide it on the backing, but it may not, either, and require that the backing be moved that 1/4". It is unlikely that putting lag bolts (or large screws) just 1/4" from existing holes will give enough support, even assuming it wasn't put where it was in order to have studs to put the screws into. But beyond that, you will have to enlarge the screw holes in the cabinet above. 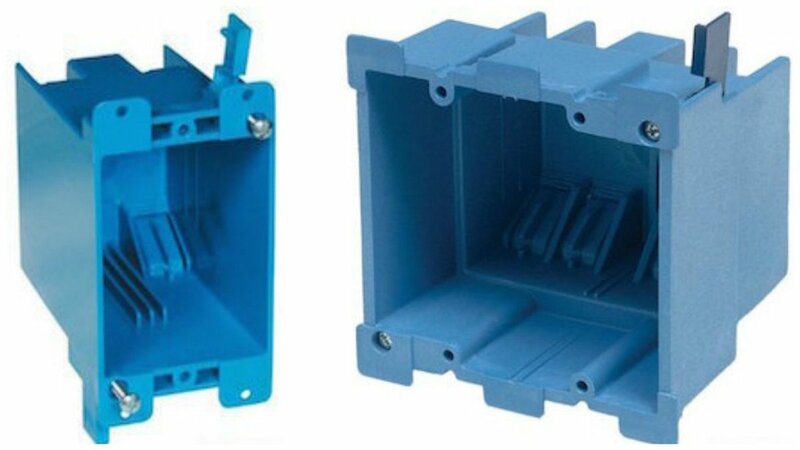 If there are blocks used to support the microwave, they can be moved and the existing holes re-used, but it will require a larger hole in the cabinet itself. If there are no blocks used to distribute the weight in the cabinet you will have to supply some. My lg microwave was not centered correctly in a 36 nice space above my 30 inch stovetop causing a gap of 2 3/4 inch on one side and 3 1/4 gap on the other side. Was supposed to have a 3 inch cabinet filler on both sides. Can the microwave be slid over a little to accommodate this or will it have to be removed and reinstalled. And what about the toggle bolts. Interesting question. It must fasten behind and above, and to material strong enough to hold it up. One must be able to get inside any "bulkhead" above and provide strong supports, although the wall behind needs only something along the lines of sheetrock. Given those requirements can be met, though, it shouldn't be too difficult - at worst open up the structure above or construct something, and then cover the opening after adding structural support. Any ideas on how to install oven top microwave if there isn't a cabinet but bulkhead instead? I have seen any that shallow. Amazon lists several at or just over 15" deep, but that's about it. I suspect it will be very hard to find (or impossible) because that will sit it quite a ways back from the front of the range and make it difficult to load and empty. Coincidentally, I very recently did just that. The last microwave I installed lasted just one year and 5 days. Five days past the warranty period. A new one was purchased, of a different brand, and installed. The brackets were radically different - there was no chance that the old bracket would fit the new microwave. Even if I had purchased the same manufacturer, I doubt that the bracket would have fit. The same model - maybe, but even that is in doubt. 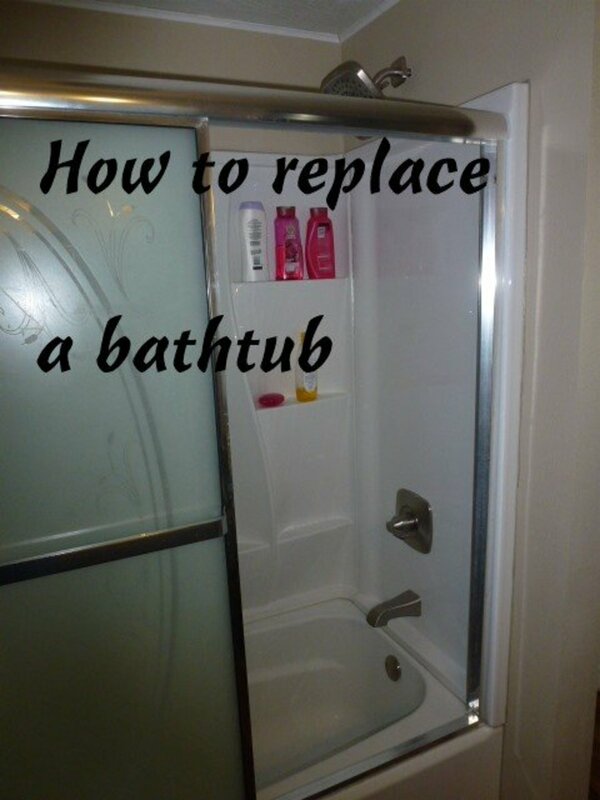 Plan on removing and replacing that old bracket. If you don't have to, well and good, but you should be prepared to do so. if i am replacing an older microwave, will the hanging bracket be the same or will i need to replace it? Thanks for the vote of confidence; I try to give instructions for someone that has never done the task before.